Today is the first day of the year on God’s calendar. 2 This month shall be your beginning of months; it shall be the first month of the year to you” (Exodus 12:2). In 2017 that is March 28th. In a few days, it will be April 1st on the Roman calendar. Depending on the year, the first day of the year that God is referring to comes in March or April in modern calendars. The Bible also refers to the first month of the year with the name Nisan (Nehemiah 2:1; Esther 3:7). The Passover and biblical holy days (some of which are also this month, see Holy Day Calendar) are based upon the calendar that begins on Nisan 1. Historically calling people fools because they did not change the biblical beginning of the year from Spring to January 1st, apparently did not help people realize when the BIBLE teaches that the year is supposed to begin. The Christian Passover for 2017 is Sunday evening, April 9th, after sunset which is when the 14th of Nisan begins. Real Christians are to prepare for it. Speaking of preparations, we also made a new video service for Passover this year: CCOG Passover Service. Keeping Passover and the Days of Unleavened Bread How should Christians keep Passover, especially if they are by themselves. Why does the Church of God not require lambs for Passover? 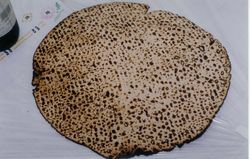 How does one keep the Days of Unleavened Bread? For a step-by-step video for Christians to keep it, check out a CCOG Passover Service. This entry was posted on Tuesday, March 28th, 2017 at 12:01 am	and is filed under COG News, Doctrine.